The Water Business In India | Business Article | MBA Skool-Study.Learn.Share. India is known as the land of opportunities. So, if someone comes and asks you about a business which you could start in India, your mind goes blank at first and then you come up with answers like IT industry, Hotel Industry or even for that matter Tourism. Starting a business in providing drinking water would probably be the last one to come to your mind. Even if you say it, one is quick to dismiss you by saying, tough competition or no first mover advantage. Is it really possible to start a business in potable water and compete with the Aquafina’s and Bisleri’s? If yes, how to do it and how profitable it can be? We are going to think of a reverse gear approach to get into ‘the Potable Water Business’ in India. Let us see what the normal approach of a product launch will be. Whenever a company want to launch a new product, they target the urban populace, go in for a massive advertisement campaign, rope in film stars or reach out to the television audience by sponsoring prime-time programs. Once their product is launched and well established, they venture into rural areas and provide their services in the name of Corporate Social Responsibility. These activities undertaken as a part of CSR also provides the much needed ‘product differentiation’. Fine, the strategy looks good, a successful time tested strategy. Now, hold on, can we think of a reverse approach to launch our water business in India. Well, let’s give an honest try. Despite 60 years of independence, the basic supply of drinking water is still a distant dream for majority of Indian villages. Close to 2.1 million children below the age of 5 years die every year due to water borne diseases. While providing access to drinking water is primarily considered to be government’s responsibility, the demand is large enough to require private sector participation. Keeping these facts in mind, our water company will start its operations from villages which do not have provision for safe drinking water. Also, the company would be a for-profit organization since ‘Capitalism has been good for America’. The mode of company’s operation would be by establishing what will be called ‘Water Stations’. It would look similar to our Petrol or Diesel pumps/stations. The water station will have a water purifying unit which will purify and store potable water. Efficient and low cost technologies like Ultra Violet water filtering can reduce the operating costs and make potable water available at a cost as low as Rupees 0.10/litre. In areas where there are no perennial sources of water, the company can transport water from nearby water rich areas. All the power requirements in the Water Station can be taken care by using electricity generated from solar power. This arrangement is required since most of the villages don’t have access to electricity. Before establishing Water Stations, we must select those villages which will have maximum benefit through such an operation. Prior to the functioning of the ‘Water Stations’, the villagers should also be educated of the necessity of using purified water for drinking. The second phase would be more about taking the Company Brand to rural India. Projecting the good work which the company is doing, the company should go in for a low cost advertisement campaign targeting the rural populace. It will include nukkadnataks and roping in local brand ambassadors like doctors, village sarpanchs etc. The phase will also include tie up with NGOs to take ‘Water Stations’ to more villages. The second phase will also include, introduction of the company’s new line of product – Bottled Water. The main reason behind the introduction of a new product line would be to capitalize on the brand value generated and to use the profit generated out of the new venture to provide bulk potable water at a still lower cost. This bottled water would be introduced again in the rural India which will include villages and Panchayats. The introduction of bottled water in Tier 1 and Tier 2 cities will be at a later stage. Now, is there a real customer base for bottled water in rural India and if so what would be the price of a 1 litre bottle of water? In rural India, peasants who work in farms usually buy packet mineral waters available in sachets of 200 ml – the cost ranging anywhere from Rupees 3 to Rupees 5. Our company will be providing 1 litre bottle of water made available through already established water stations. Making the water bottles available through Water Stations also plays a major role in reducing the costs by avoiding intermediaries. Now let us arrive at the cost of a 1 litre bottle of water. 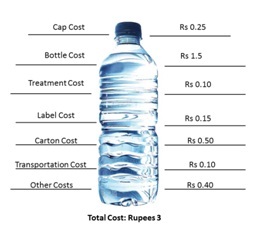 From the figure, we can come to a conclusion that, a 1 litre bottle of water will cost around Rupees 3. If we are taking a margin of Rupees 1 and we will be able to sell the 1 litre bottle at a cost of Rupees 4. Once the economies of scale are achieved, the margin from sale of each 1 litre bottle of water is sure to go up. Arrangements can also be made to collect used water bottles, which will be recycled and which can further reduce the cost and the entire process can thus become environmental friendly. This stage would see the company expand into the urban markets (Tier 1 and Tier 2 cities). By this time, the company would have become a brand well known to provide safe drinking water at affordable rates. In this phase, the company would be ready to take on the Aquafina’s and Bisleri’s of water market. The wealth and experience in providing potable drinking water to rural masses at a nominal rate would place the company in good stead to tackle the bigger players. After the success of phase 3, the company should try diversification by getting into related markets like, manufacturing miniature water purifiers for home based customers. 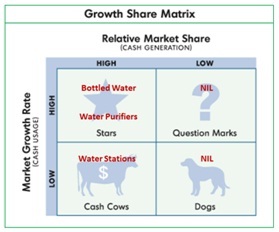 Now if we draw a BCG matrix for the company, it would look like this. The Water Stations established in the First Phase would be the company’s Cash Cow. The Bottled Water and Water Purifiers will be the company’s stars with immense growth potential. This small and ambitious approach shows how one can enter into an existing market with a huge potential by tapping into the rural consumer base of India. By doing so, one ends up doing real social service by addressing the needs of neglected sections of society. Isn’t that real corporate social responsibility?